The worst movie of the year so far has a good chance to retain the title for all of 2012. Ripping off a few lousy comedies, “One For The Money” manages not only to be bad, but to drill a hole deeper into the scum. Yep that’s Katherine Heigl again (the perpetrator of such misfires as “Killers” and “The Ugly Truth”), playing Stephanie Plum, an unemployed former lingerie saleswoman turned “bounty hunter”. Her mission? to capture a murderous and corrupt cop (Jason O’Mara) who also happened to be her boyfriend years earlier. How original! The plot goes from dumb to dumber as we follow this tiresome cat and mouse game that resembles the one from “The Bounty Hunter” (another horrible movie by the way). Is it a comedy? Is it a thriller? You’ll die of boredom trying to figure this one out. Heigl, totally miscast here, tries her best. But it’s not enough. Worse, she also helped produce this atrocious thing. As for O’Mara, he could be Gerard Butler’s stunt double, and I don’t mean it as a compliment. I could go on, but do I really have to? From the amateur acting, writing and directing to an ending that is as predictable as Paris Hilton’s I.Q, “One For The Money” will make you puke for all the wrong reasons. It just lies there flapping like a dying fish. 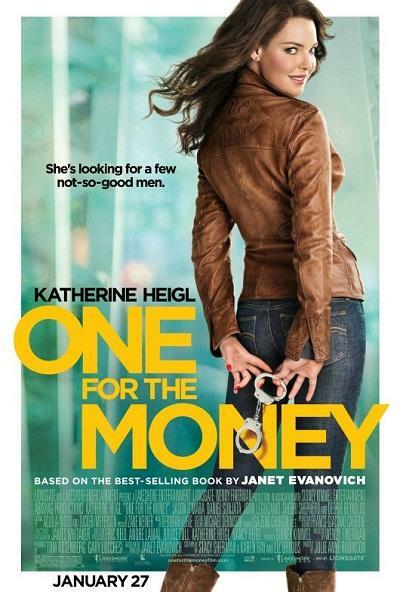 Katherine Heigl, you’ve done it again!